This year’s Free Comic Book Day had some great boss that I wanted. I got none of them. 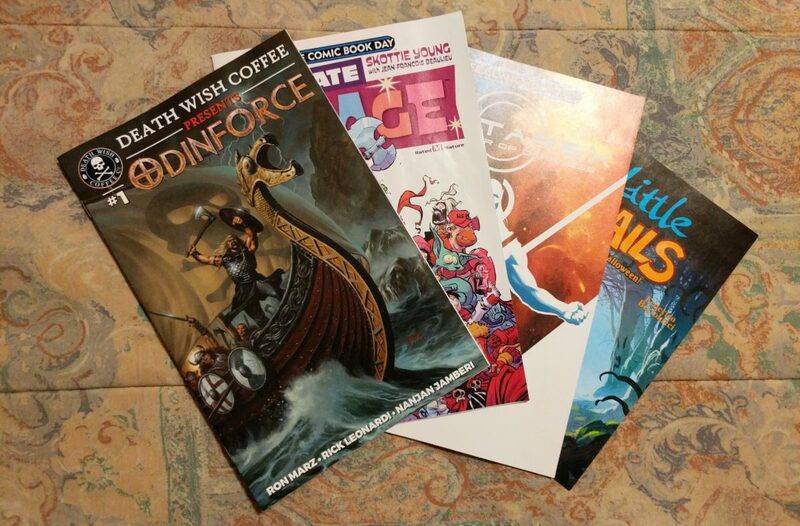 I was happy to get the Odinforce comic from Death Wish Coffee. I’m a big fan of their coffee and it’s cool to see a local company publish a comic book. I got a late start because I was out at garage sales sourcing items for eBay. I did manage to find a Walkman and a collectible key chain. There’s was a con in town so there were hundreds more people around than normal. I didn’t manage to get to the comic shop until 3 p.m. and most of the comics were gone. Despite that, the shop was still very crowded. There were also a few cosplayers still hanging around who I’m sure would soon head back to the con. We stopped by the con for a few minutes and I briefly entertained going in with my kids but when I heard another family was shelling out $100 I quickly changed my mind. Even though I didn’t get the comics I wanted it was fun to take my kids to the comic shop and see all the people in costume. Maybe next year I’ll get a better haul. Did you go out on Free Comic Book Day? Did you get all the books you wanted?